God speaks to us this Sunday about two holy women and their witness to generosity, to selfless self-giving love, to love of God and love of neighbor, the two Great Commandments. In the first reading (1 Kings 17:10-16), the Lord sends Elijah to Zarephath in Sidon to be cared for by a widow – and even though the widow, her son and the region were suffering from famine, she gives some of the last of her food to the Prophet Elijah. She trusted in the Lord’s message: “The jar of flour shall not go empty, nor the jug of oil run dry, until the day when the Lord sends rain upon the earth.” And His promise was fulfilled (Luke 4:25-30). In the Gospel (Mark 12:38-44), we find Jesus in the Temple watching people put money into the treasury. “Many rich people put in large sums. A poor widow also came and put in two small coins worth a few cents.” From our human viewpoint, the widow’s gift had little importance. Yet for Jesus, this gift had great significance. As the poor widow was leaving the Temple, Jesus pointed her out to His disciples: “Amen, I say to you, this poor widow put in more than all the other contributors to the treasury. For they have all contributed from their surplus wealth, but she, from her poverty, has contributed all she had, her whole livelihood.” The Lord praises acts of generosity for the sake of the Kingdom – selfless, self-giving love, done with a pure heart. Jesus values the disposition of the giver more than the gift received – Saint John Chrysostom has said that Jesus looks not only on the amount given, but into the very heart of the giver. Almsgiving is a work of mercy that pleases our Lord. It is not just for Lent – it’s always in season. When we are generous with our time, talents and treasure (all gifts from God) for the good of those who are in need, we’re giving alms. Saint John Vianney would often say: “A house of charity will never be poor.” The good habit of giving alms, of being charitable, summarizes many of the virtues. 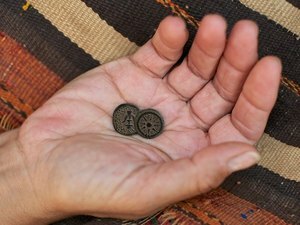 And Jesus Christ will reward our generosity, for He does not want us to be miserly with our gifts of time, talents and treasure, as the Lord loves a cheerful and generous giver (2 Corinthians 9:6-8) – contrast this with the miserly, selfish rich man who was sent to eternal punishment for his cold indifference to Lazarus (Luke 16:19-31). May we think today of the generous poor widow returning to her home filled with great joy. What a surprise would be in store for her at the end of her life! She would finally see the look of love that Jesus had when he looked at her that ordinary morning in the Temple – for God the Father, Son and Holy Spirit watches all of our actions with concern, affection, love and mercy. May we respond with selfless self-giving love, in our love for Him and for our neighbor.